Looking for a hands-on service project in our community? Trinity is participating in a monthly service project at Church Community Services in Elkhart. 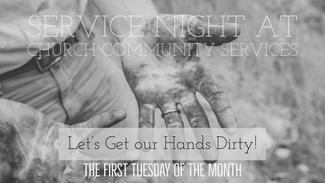 We will volunteer on the first Tuesday of every month from 6-8pm to assist with various projects. No special skills are needed. Children 10 years of age and older are welcome to join in but must have an adult accompany them. We need a minimum of 6 people and a max of 15 for each evening. Please sign up in advance, so we know how many people to expect. What a great way to reach outside of our own four walls and help those in need!